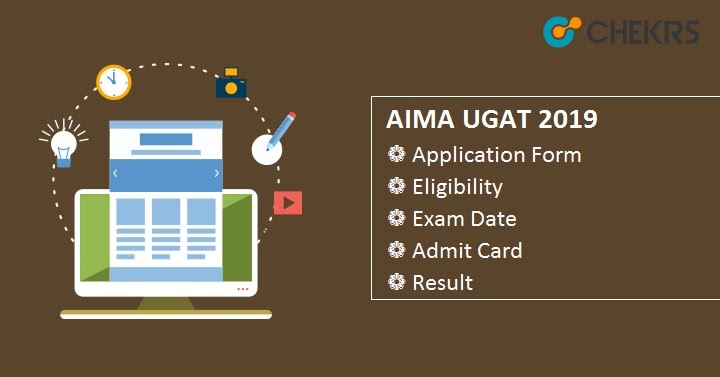 AIMA UGAT 2019: Commonly known as UGAT, is a national level entrance test. It is managed by All India Management Association (AIMA). It is an annual entrance exam which provides admission into Integrated MBA (IMBA), BBA, BCA, B.Com, BHM, and other UG courses. UGAT Scorecard is considered by many colleges and universities to provide admission. In this article, we will talk about UGAT AIMA, UGAT Application form, exam date and other important details. Offered Courses: IMBA, BBA, BCA, B.Com, BHM, and other UG courses. Official notification will be available soon but before that here is the table consisting all the tentative dates of the AIMA UGAT. The table will be updated after the release of the Official AIMA UGAT 2019 Schedule. There are no special Eligibility Criteria but still candidate need to check out all the eligibility criteria before filling the AIMA UGAT Application form. All the interested candidates must be qualified 10+2 or equivalent exam from any recognized board. Students appearing in 12th exams are also eligible for UGAT AIMA. UGAT Application form will be available in Online and also in offline mode. Candidates need to go to the official website to fill the UGAT AIMA Application form. If the candidate is preferring offline mode then the UGAT Application Form will be available at the centers notified by the AIMA. They can buy the UGAT AIMA Application Form after paying Rs. 650/- at that center. AIMA UGAT Application Fee will be Rs. 650/- candidate can pay the fee using debit/credit card or net banking. If they preffer Offline mode of payment then they can pay the fee using DD in the favor of “All India Management Association” payable at Delhi. After Submitting the application for you will need the details of UGAT AIMA Exam Pattern to prepare better and get good marks. So to help you out in this we are providing all the basic details of UGAT Exam pattern. The Syllabus will be released on the official website so prefer the syllabus for the preparation. The AIMA UGAT Syllabus will consist of subjects English Language, Reasoning & General Intelligence, Numerical & Data Analysis, General Knowledge for MBA, BBA, BCA and other UG Courses. The AIMA UGAT Syllabus for BHM will consist of subjects English Language, Reasoning & General Intelligence, Numerical & Data Analysis, General Knowledge, Service Aptitude, and Scientific Aptitude for BHM. Applicant required for the preparation for the exam so we provided here the some AIMA UGAT Preparation Tips for the applicant who appearing for the exam. To get the idea of the question paper applicant can solve the UGAT Previous Year Question Paper, In order to get the good marks in the exam. The Admit card will be released on the official website. The candidate has to go to the official website apps.aima.in and access and download the admit card. Candidates also have to affix photograph of preferred size at the right place in the admit card. Candidates have to carry this AIMA UGAT 2019 Hall ticket to the exam center. So keep it safe also. Admit card will be also helpful in the Admission process and in a situation when you not received or lost the scorecard. AIMA UGAT Result will be released in the month of June 2019. Candidates can check the UGAT result on the official website by entering their Form number and roll number. AIMA UGAT scorecard will be released on the official website. And for candidates who filled the application form through the offline mode, their Scorecard will be delivered to the provided Address through Post. If in any case candidate not received or lost the Scorecard, He can request for the duplicate UGAT Scorecard by writing an application to the authority. There is no Counselling round in this Entrance exam. Admission will be provided on the basis of result and Scorecard. Admission process will start just after the declaration of result. In AIMA UGAT Admission process candidates have to report at the participating colleges which have vacant seats available. Colleges also conduct some admission round to shortlist candidates, so candidates have to take care of it also. Admission will be provided after document verification and seat allotment. Seat allotment in particular colleges will be done on the basis of AIMA UGAT Entrance score, category, and seat availability in that college in the preferred course.